I had a girl friend who used to smoke a lot. she was just so crazy about smoking.well no one can be crazy about smoking but she was.she was a kind of chain smoker. we were working in the same organisation and we were deep into relationship.i loved her and overlooked her habit of smoking.she was a kind who used to smoke in every break in between work.i spoke to her lot many times about it.i told her its not good for our kids , if we will have any.most of the times she laughed or smile and used to ignore it.i got plenty of friends who smoke around me ,when i was in london i had friends who used to smoke and drink.well drink is still alright but smoke , oh my god a serious no no to me. I really feel strong when i see myself not smoking and others around me smoke.though i do passive smoking but its a different thing ,its something you can’t get away with it.today air we breathe in is so polluted that its more harmful then smoking cigarettes. we all know how bad it is for health , we all know that on the pack of cigarettes we find “smoking is injurious to health”. even then we don’t stop ourselves from smoking.why its like this ? it is because we don’t have control on our mind.we just can’t help it. Imagine you are in a room which has moist temperature.your air conditioner is not working and your room has no ventilation.you are on the couch with a pack of cigarettes and a bottle of bear.you are in your thoughts and smoking and smoking and smoking.you are sweating at the same time.you are so much in sweat that it looks like you took shower and put your clothes on while you were still wet.droplets of sweat is pouring out of your skin.but your are enjoying this.you are feeling uneasy and shivers a little when a puff of wind blows into your room and touches your skin and gives you that cold feeling.you are still smoking .you are done with one and lights another one and starts smoking it.over and over and over you smokes as many cigarettes as you want.you just don’t stop.you lights another one.this time its different.you feels a burn inside your body.you feel like something is going to explode in you.you sweat even more harder.its becomes bad and your stomach starts aching and your head feels heavy.you don’t know what is happening.you look around , unfortunately you are the only one in your room.you don’t see anyone outside either because you live in an isolated area which is in the middle of the jungle.hardly ever any one comes by this way.now you don’t know what to do.you are confused and your mind is not thinking right.now you starts feeling something has starts burning inside you.you smells the burn of skin.you questions yourself ” is this your skin burning ” ? even before you think of something you see yourself in flames ,you try to scream but you can’t , you are so much in flame.you get burned from the waist all the way up to your head.you are dead.you are done with your life.your soul comes out of our body and sees at the charred burned body.you can’t do anything ,you have already left this world.now you wish if you had stopped smoking in time.but its too late you can’t undo it what you have written yourself.it was your destiny. Ever heard of this term ? this is something which still baffles the experts.its one of the biggest science mysteries and yet we have no solid conclusions.this what we call as Spontaneous Human Combustion. Take these famous Spontaneous Human Combustion cases documented. Over the past 300 years, there have been more than 200 reports of persons burning to a crisp for no apparent reason. The first reliable historic evidence of Spontaneous Human Combustion appears to be from the year 1673, when Frenchman Jonas Dupont published a collection of Spontaneous Human Combustion cases and studies entitled De Incendiis Corporis Humani Spontaneis. Dupont was inspired to write this book after encountering records of the Nicole Millet case, in which a man was acquitted of the murder of his wife when the court was convinced that she had been killed by spontaneous combustion. Millet, a hard-drinking Parisian was found reduced to ashes in his straw bed, leaving just his skull and finger bones. The straw matting was only lightly damaged. Dupont’s book on this strange subject brought it out of the realm of folkloric rumor and into the popular public imagination. On April 9, 1744, Grace Pett, 60, an alcoholic residing in Ipswich England, was found on the floor by her daughter like “a log of wood consumed by a fire, without apparent flame.” Nearby clothing was undamaged. In the 1800’s is evidenced in the number of writers that called on it for a dramatic death scene. Most of these authors were hacks that worked on the 19th century equivalent of comic books, “penny dreadfuls”, so no one got too worked up about it; but two big names in the literary world also used SHC as a dramatic device, and one did cause a stir. Twenty years later, in 1852, Charles Dickens used Spontaneous Human Combustion to kill off a character named Krook in his novel Bleak House. Krook was a heavy alcoholic, true to the popular belief at the time that SHC was caused by excessive drinking. The novel caused a minor uproar; George Henry Lewes, philosopher and critic, declared that SHC was impossible, and derided Dickens’ work as perpetuating a uneducated superstition. Dickens responded to this statement in the preface of the 2nd edition of his work, making it quite clear that he had researched the subject and knew of about thirty cases of SHC. The details of Krook’s death inBleak House were directly modeled on the details of the death of the Countess Cornelia de Bandi Cesenate by this extraordinary means; the only other case that Dickens actually cites details from is the Nicole Millet account that inspired Dupont’s book about 100 years earlier. book about 100 years earlier. 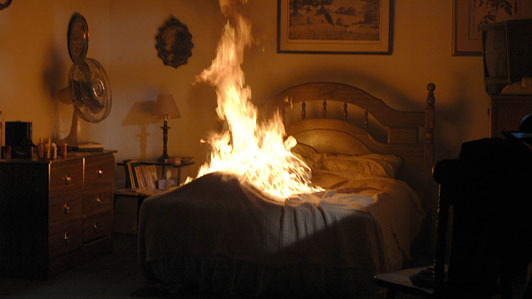 In 1951, the Mary Reeser case recaptured the public interest in Spontaneous Human Combustion. Mrs. Reeser, 67, was found in her apartment on the morning of July 2, 1951, reduced to a pile of ashes, a skull, and a completely undamaged left foot. This event has become the foundation for many a book on the subject of SHC since, the most notable being Michael Harrison’s Fire From Heaven, printed in 1976. Fire From Heavenhas become the standard reference work on Spontaneous Human Combustion. On May 18, 1957, Anna Martin, 68, of West Philadelphia, Pennsylvania, was found incinerated, leaving only her shoes and a portion of her torso. The medical examiner estimated that temperatures must have reached 1,700 to 2,000 degrees, yet newspapers two feet away were found intact. On December 5, 1966, the ashes of Dr. J. Irving Bentley, 92, of Coudersport, Pennsylvania, were discovered by a meter reader. Dr. Bentley’s body apparently ignited while he was in the bathroom and burned a 2-1/2-by-3-foot hole through the flooring, with only a portion of one leg remaining intact. Nearby paint was unscorched. July 1, 1951 — Perhaps the most famous case occurred in St. Petersburg, Florida. Mary Hardy Reeser, a 67-year-old widow, spontaneously combusted while sitting in her easy chair. The next morning, her next door neighbor tried the doorknob, found it hot to the touch and went for help. She returned to find Mrs. Reeser, or what was left of her, in a blackened circle four feet in diameter. All that remained of the 175-pound woman and her chair was a few blackened seat springs, a section of her backbone, a shrunken skull the size of a baseball, and one foot encased in a black stain slipper just beyond the four-foot circle. Plus about 10 pounds of ashes. The police report declared that Mrs. Reeser went up in smoke when her highly flammable rayon-acetate nightgown caught fire, perhaps because of a dropped cigarette. But one medical examiner stated that the 3,000-degree heat required to destroy the body should have destroyed the apartment as well. In fact, damage was minimal – the ceiling and upper walls were covered with soot. No chemical accelerants, incidentally, were found. In 1944 Peter Jones, survived this experience and reported that there was no sensation of heat nor sighting of flames. He just saw smoke. He stated that he felt no pain. Alchoholism – many Spontaneous Human Combustion vicitms have been alcoholics. But experiments in the 19th century demonstrated that flesh impregnated with alcohol will not burn with the intense heat associated with Spontaneous Human Combustion. – Deposits of flammable body fat – Many victims have been overweight – yet others have been skinny. – Devine Intervention – Centuries ago people felt that the explosion was a sign from God of devine punishment. – Build-up of static electricity – no known form of electrostatic discharge could cause a human to burst into flames. – An explosive combination of chemicals can form in the digestive system – due to poor diet. – Electrical fields that exist within the human body might be capable of ‘short circuiting’ somehow, that some sort of atomic chain reaction could generate tremendous internal heat. No satisfactory explanation of Spontaneous Human Combustion has ever been given. It is still an unsolved mystery. The body is normally more severely burned than one that has been caught in a normal fire. – The burns are not distributed evenly over the body; the extremities are usually untouched by fire, whereas the torso usually suffers severe burning. – In some cases the torso is completely destroyed, the bones being reduced completely to ash. – Small portions of the body (an arm, a foot, maybe the head) remain unburned. – Only objects immediately associated with the body have burned; the fire never spread away from the body. SHC victims have burnt up in bed without the sheets catching fire, clothing worn is often barely singed, and flammable materials only inches away remain untouched. – A greasy soot deposit covers the ceiling and walls, usually stopping three to four feet above the floor. – Although temperatures of about 3,000 degrees Fahrenheit are normally required to char a body so thoroughly (crematoria, which usually operate in the neighborhood of 2,000 degrees, leave bone fragments which must be ground up by hand), frequently little or nothing around the victim is damaged, except perhaps the exact spot where the deceased ignited. Some events of Spontaneous Human Combustion are witnessed but some are not. All reported cases have occurred indoors. The victims were always alone for a long period of time. Witnesses who were nearby (in adjacent rooms) report never hearing any sounds, such as cries of pain or calls for assistance. In the witnessed combustions – people are actually seen by witnesses to explode into flame; most commonly. Here the witnesses agree that there was no possible source of ignition and/or that the flames were seen to erupt directly from the victim’s skin. Unfortunately, most of the known cases of this type are poorly documented and basically unconfirmed. Sometimes there are no flames seen by the witness. Non-fatal cases – Unfortunately, the victims of these events generally have no better idea of what happened to them than do the investigators; but the advantage to this grouping is that a survivor can confirm if an event had a simple explanation or not. Thus, there are far fewer cases of Spontaneous Human Combustion with survivors that can be explained away by skeptics without a second look. Sometimes victims develop burns on their bodies that have no known external cause. These strange wounds commonly start as small discomforts that slowly grow into large, painful marks. Sometimes the victim will exhibit a mysterious smoke from the body. In these odd and rare occurrences smoke is seen to emanate from a person, with no associated fire or source of smoke other than the person’s body. This can happen to you.all this may sound like a crazy episodes or may does not look like something which just can not takes place.but what if it does ? what if all this we discussed above may contribute to your burning. We all walk with fire inside us.there is something which we have inside waiting to explode.lets not ignite a spark ,its like a time bomb,you time it right and it will explode ,taking your precious life away from you. You don’t want to play with it, don’t do it.